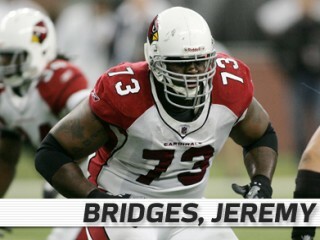 Jeremy Bridges is an American football guard for the Arizona Cardinals of the National Football League. He was drafted by the Philadelphia Eagles in the sixth round of the 2003 NFL Draft. He played college football at Southern Mississippi. 2009: After signing with the Cardinals on 9/8, served as the primary backup G/T and started four of the final five regular season games as a well as both postseason contests at LT in place of injured T Mike Gandy (pelvis) … including the regular and postseason, the offense registered over 100 yards rushing in five of his six starts (113 vs. Min, 122 @ Det, 110 vs. StL, 156 vs. GB, 101 @ NO) … played in all 16 regular season games for the first time in his career … filled in at RT during the second quarter for injured starter Levi Brown (sprained ankle) @ Jax (9/20) … saw time on special teams in the next five games … played LT for Gandy who left in the fourth quarter due to a pelvis injury @ Ten (11/29) … registered 40th career start but first at LT in place of the injured Gandy vs. Min (12/6); marked first start for the Cardinals since 1/1/06 @ Ind; held Vikings DE Jared Allen, the NFC’s sack leader heading into the game, to 0 tackles and 0 sacks for the first time in ’09 … played in 75th career game, filling in at LT for Gandy who left the game in the third quarter @ SF (12/14) … for the second time in ‘09 started at LT in place of Gandy (pelvis) and helped the offense total 122 yards rushing @ Det (12/20) … part of line that only gave up one sack on 33 pass attempts and cleared the way for 156 rushing yards against the NFLs number one ranked rush defense during the regular season in the Wild Card matchup vs. GB (1/10/10); marked the highest rushing total against a GB defense that only gave up 83.3 yards per game … started at LT and helped block for 101 rushing yards on 15 carries @ NO (1/16/10). 2008: Saw action in 14 games with four starts and started the Panthers only postseason game … helped RB DeAngelo Williams finish third in the NFL with 1,515 rushing yards … started vs. KC (10/5) helping Carolina record 205 rushing yards on a season-high 48 attempts, the most rushing yards since a franchise record 242 vs. StL (11/19/06). 2007: Registered 10 starts in 13 games played and helped Carolina rush for at least 114 yards in six of the team’s seven wins … part of line that helped establish a season-high 44 rushing attempts for 166 yards vs. SF (12/2) … saw action at RT in place of injured Travelle Wharton @ TB (12/30); helped pave the way for 180 yards rushing and two TDs. 2006: Signed as a free agent by Carolina on 9/12 after being waived by Arizona on 9/2 … set a career-high by starting the final 14 games … part of line that cleared the way for Carolina to rush for over 100 yards in nine games … helped give QB Jake Delhomme enough time to total 365 yards passing @ Bal (10/15) … helped open lanes for a team-record 242 rushing yards vs. StL (11/19) and tied a team record with 13 rushing first downs; offense also maintained possession for 41:17, the second highest mark in team history. 2005: Spent training camp with the Cardinals and was released on 8/31 … re-signed with the team on 10/12/05 … saw action on special teams vs. Ten (10/23); @ Dal (10/30) and vs. Sea (11/6) … released by the team on 11/8 … re-signed on 11/15 … started at RG @ StL (11/20) but suffered an ankle injury … deactivated for the next three games … returned to the field @ Hou (12/18) and started at LG in the final two games of the season vs. Phi (12/24) and @ Ind (1/1/06). 2004: Awarded off waivers (Phi) on 9/6 following the 53-man cut down … entered the game at RG in the second quarter vs. NO (10/3) and played there through the end of the game … recorded the first start of his career at RG @ SF (10/10) and started at RG for the next six games … DNP @ Det (12/5) or vs. SF (12/12) … saw action on special teams vs. StL (12/19) … returned to RG after LT Leonard Davis left the game due to a knee injury and the offensive line shuffled to compensate @ Sea (12/26) … started at RG in the season finale vs. TB (1/2). 2003: Made the Eagles 2003 opening day roster but was inactive for all 16 regular season games and both postseason contests. A four-year player, started 45 consecutive games for Southern Mississippi after redshirting his freshman year … played both right and left tackle for the Golden Eagles … earned All-Conference USA honors as a senior … opened lanes for RB Derrick Nix to record 1,194 rushing yards, the fourth highest total in school history … started all 11 games as a junior and was a second-team All-Conference USA selection … part of a line that allowed QB Jeff Kelly the time to throw for 2,613 yards, the third highest total in school history … as a sophomore started all 12 games including the GMAC Bowl … earned Conference USA All-Freshman honors after starting 10 games for a Southern Miss team that won the Conference USA championship. Full name Jeremy Eugene Bridges … graduated from South Pike (McComb, MS) High School, where he earned Pike County Player of the Year honors … earned a degree in sports administration from Southern Mississippi … he and his wife, Brenda, have four children, sons James and Joe, and daughters Anaia and Daija … the youngest of seven children (two brothers, five sisters). View the full website biography of Jeremy Bridges.